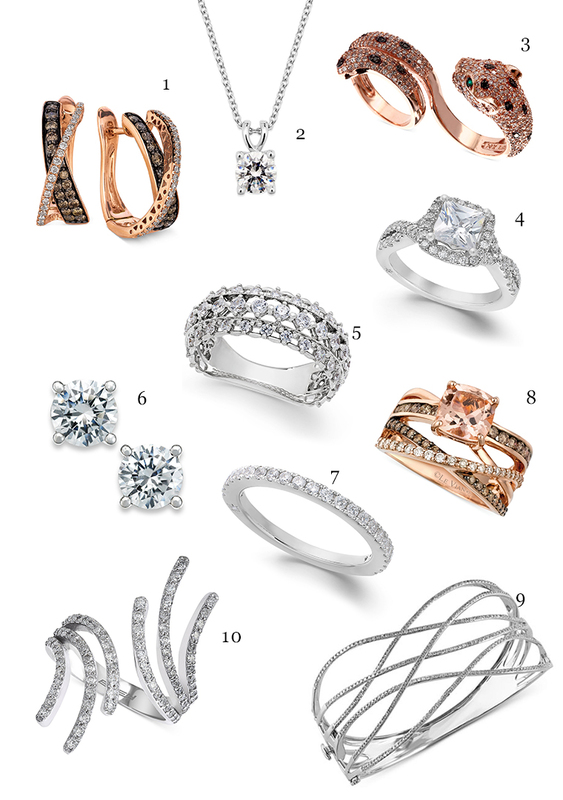 Today’s post is all about jewelry – diamonds to be specific! My first experience with fine jewelry was when I was in middle school and my parents would go on vacation to the Caribbean. When they came back they would always bring me a beautiful precious stone ring with small diamonds. I remember feeling so incredibly special. I still have all of those beautiful rings and cherish them now just as much as I did then. My next significant moment with diamonds completely changed my life. It’s when I got engaged to my husband. I actually helped pick out the ring. I remember just knowing what ring was meant to be on my finger for the rest of my life when I first saw it. Coincidentally, I had the same experience when I went on the very first date with my husband – I just knew he was the one. My most recent experience with diamonds was when my mom handed down her tennis bracelet to me. I love the way the classic design seamlessly styles with my more contemporary pieces. I always think blending classic with contemporary strikes the perfect balance. No doubt diamonds are beyond meaningful – whether they represent love, a new beginning with someone special, are handed down, or are a gift to yourself (because you’re awesome!). They are reflections of significant moments in our lives and are tied to those incredible memories. Macy’s is having their semi-annual diamond sale now and it’s good, really good. Below are some pieces that caught my eye. The two finger panther ring and classic stud earrings are at the top of my wish list. They have an unbelievable selection so be sure to check it out! This post is sponsored by Macy’s and supported by Shopping Links. Loved the article and agree about the two panther ring and the classic studs! Where’s the gray leather jacket from? Thanks! Hi Erica, what about the jacket? A great post! I’ve been handed down some pieces from my family, but they seem to collect dust in my jewelry box. I’m going to start mixing them in with my more contemporary jewelry. Thanks for the inspiration! Gorgeous, so many great pieces!